Recipe for ice cream sandwich cake. I needed a simple dessert recipe for a small group a few weeks ago. I started reading some of the magazines I read for a few summer reviews. I found a recipe for an ice cream cake that was pretty complicated BUT that reminded me of the cake I made a few years ago. I searched on my blog and realized that I had never shared this simple summer recipe with you. 1. Mix 1 cup Whip Cool with hot fudge to make the filling. 2. Remove the wraps from the sandwiches and place them on a plate. 3. Place the aluminum foil on the counter and place 4 ice-cream buns side by side in the middle of the sheet. 4. Divide half of the filling over the ice creams. 5. Stack 4 extra ice creams on the filling. 6. Fold out the rest of the filling on the second layer. 7. Add the third layer of ice cream sandwiches. 8. Freeze the cake with the 8 ounce Cool Whip. 9. Wrap the cake well in aluminum foil. 10. Freeze for at least 4 hours. To make it more festive, you can cover it with colored sparks. I hope you enjoy this light summer cake! Do not hesitate and share it with your friends on the Easy Recipes board of Pinterest. This cake looks so beautiful and nobody needs to know that you have deceived ice rolls. It will be our little secret. Also think of all possibilities. You can mix ground or egos with the fresh whip to turn them into biscuits and whipped cream cakes, or you can add colored glaze between layers to customize a holiday. 1. Remove the wrapper from all ice cream sandwiches. You have to move quickly because the ice is melting. 2. Place 3 ice-cream sandwiches side by side in a tart mold. 3. Sprinkle with candy and chocolate. 4. Place another 3 ice cream roll in the other direction. 5. Sprinkle with more caramel and chocolate. 6. Do this 2 more times, so there are four. 7. When the ice cream rolls melt, place them in the freezer for 30 minutes to an hour. 8. "Ice" the cake with a fresh whipped. 9. Then sprinkle caramel and chocolate on top so that they can drip on the sides. 10. Freeze for at least 2 hours before cutting and serving. Also try this homemade recipe for plain vanilla ice cream! It is as smooth and creamy as it is incredibly easy to do. You do not even need an ice machine to make this delicious homemade ice cream! Ice-pops are also great to beat the heat. You will love cookies and ice cream! These cream-colored pops are full of whipped cream, Oreo biscuits and they taste absolutely fantastic! 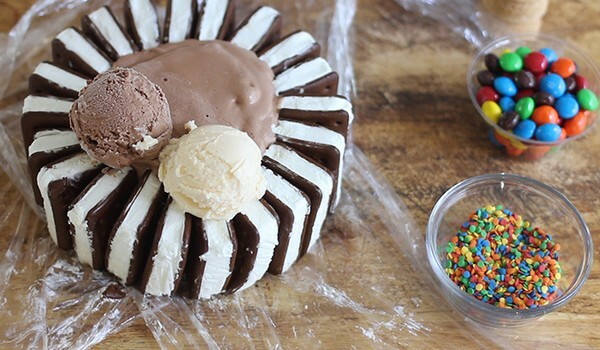 The delicious striped crust for this frozen dessert is made with ice cream rolls. This recipe uses mint ice cream with chocolate chips, vanilla yogurt and strawberry ice cream to refill, but you can use any combination of ice cream and frozen yogurt. 1. 1 of 5 Cover the bottom and side of a 9-inch round spring with a non-stick cooking spray. Cover the page with parchment or grease-proof paper and attach it to the pan with a sprinkler. Cut the paper up to the height of the drawer. 2. 2 of 5 cut the cookies into a food processor. Add milk; Simply pulsate until the mixture stays together. 3. 3 of 5 4 rolls of ice cream to be unpacked. Work fast, cut everyone in four. Staple sandwich strips at one end, conveniently pack them around a frying pan with lined paper. Repeat with the remaining rolls to form a raised edge. Spoon the cookie crumbs in the middle of the pan; Press firmly on the floor. 4. 4 of 5 Remove the 3 flavors of ice cream or frozen yogurt from the freezer and let it soften for 15 minutes at room temperature. Put the mint ice in a small bowl and stir until it has a good consistency. Repeat with vanilla and strawberry. Remove the pan from the freezer. Spread the mint ice on the ground, cover with vanilla and strawberry and distribute all layers evenly. Fill with thawed topping and decorate, decorative. Smash the remaining 3 cookies and sprinkle over the cake. Back in the freezer; Freeze all night. 5. 5 of 5 Remove the side of the tray and then the paper to serve. If you are looking for a simple and sober dessert without baking this summer, then look at this simple and delicious cake with ice creams! It takes less than 10 minutes to arm, but it looks like an elegant ice cream cake. Instructions: line out a bread tray with grease-proof paper. Put a layer of ice-cream sandwich on the floor (if you use the Blue Bunny brand, the length fits perfectly into a loaf of bread and you only have to have one of the rolls). Spread half of the Cool Whip over the sandwiches, followed by another layer of ice cream and the rest of the fresh whip. Then sprinkle the chopped chocolate bar on it (or the chocolate pieces would work too!). Freeze for at least two hours and a maximum of one week. To serve, put on the wax paper; The cake should come out. Put on a cake board. If desired, sprinkle with sweet chocolate before serving. This is so easy to do, super nice and looks like A-M-A-Z-I-N-G! If you have a larger audience, double the recipe and use a larger pan.